The society of past generations is shown graphically through the work of writers. Mark Twain, Jane Austen, Charles Dickens, Victor Hugo, Robert Louis Stevenson, H Rider Haggard, Alexandre Dumas to name a few. Who could read Jane Austen’s Mansfield Park without living that society through eyes of Fanny Price, seeing the hypocrisy of social sham with the implication that it was built on the slave trade? My good friend, Uncle Albert Holt, tells his real-life story of growing up on Queensland’s Cherbourg Aboriginal Mission in Murri on a Mission, Gunnan Gunnan. It is a story of the poor fellow, of sorrow (Gunnan, Gunnan) but it is told with optimism; with the sense of resilience and humour which has seen Aboriginal people successfully through the oppression of the Act. Contemporary Queensland novelist, Kate Morton, researches her history so well that she can even make a building (Milderhurst Castle) into a character which draws the reader into the thinking of that era. Peter FitzSimons, in Kokoda, has listened to the people who were actually there and has the talent to build a World War II experience into the sensations of heat, damp, cloying air, fear, mateship and anger; which are coupled with extraordinary physical and mental tenacity. Richard Flanagan’s award-winning The Narrow Road to the Deep North is again influenced by people Flanagan has interviewed, not least his father who was on the Thai-Burma Railway. But Flanagan lifts the reader into a higher level than just an experience of the sights, sound, smells and oppression of that experience. Rather, he tells his fictional tale about frailities, moral decisions and the social expectations of an era – with messages for this era. Perhaps, the greatest social writing of Western civilisation comes through the works attributed to William Shakespeare. Irrespective of the debates about authorship, the quality of the plays and poems takes the audience and reader into the old world of Verona, the mental torment of the Danish prince, Hamlet, the social duplicity in Macbeth and the witty fun of Midsummer Night’s Dream. His insights are extraordinary, which is why the works have stood the test of time. The difference between writing and movies is that the reader can mix personal experience and imagination, with the words, to live the story. A movie director chooses the visual images to channel a more restricted point of view – and in a short time-slot. 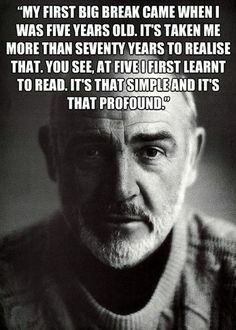 Sean Connery, when being given a lifetime award for his acting career, said it wasn’t the James Bond role that gave him his big break, it was learning to read and finding public libraries. Read away! Visit a library. Transport yourself away from the routine of daily life. Enjoy.